I got an e-mail from one of the P90X coaches who had read my blog saying that I would soon be noticing the difference. I was sceptical but sure enough the exercises felt easier this week. For the first time I was able to do all of the Ab Ripper X (OK – confession, I had to take a short break during the set of 50 George Mason’s). The biggest problem was keeping up the training with travelling – Mon/Tues in Toronto; Wed/Thurs/Fri/Sat Washington; Sunday Orlando. When all is said and done must see how many different places (especially hotel rooms) I’ve done this in. I was in my favourite running shop for some shoes and was surprised by the array of socks that were available. What was noticeable was that they did not have what I have found to be by far the best socks: drymax. The really are the best kept secret of endurance athletes. Christopher R. Bennett, a civil engineer for the World Bank who was out of the country for work 172 days last year, is one of what experts say is a growing number of business travelers who bicycle while on assignment. 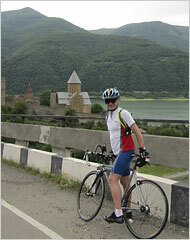 Christopher Bennett, a civil engineer on assignment in Tbilisi, Georgia, for the World Bank, gets around on two wheels. “To me, cycling is part of my DNA,” Mr. Bennett said in an interview from Tbilisi, Georgia, where he was overseeing investment in road construction. He travels with a bike that disassembles and fits in an average-size suitcase, or uses bicycles he stores at hotels he frequents. “Bellhops know when I’m coming and bring them to me,” he said. Hard to believe that I have completed four weeks of P90X, with only a few missed workouts. Last week was a rest week so now I am back into the harder training. They claim that after this phase of the program “you should start to feel very strong and ready to pump more iron (or stretch more rubber! ).” We will see. The biggest challenge is juggling the routine around the travel and training for the Athens marathon. My wife Lis says that my ideas fall into two broad categories: (i) brilliant or (ii) brainless, with few in between. I was up in Toronto for the weekend to visit my parents and needed to do a long run. Rather than do my normal out and back I decided to do a long run down to and along Toronto’s waterfront and then grab a taxi back home. The run turned out to be one of the rarities: both brilliant and brainless … Kind of like my decision to run the Athens marathon in two weeks with only four weeks of training. If you are an iPhone user check out this posting which lists apps that you might find interesting. Thanks to Amber Johnson for this! Time is passing quickly! I am now into week 4 which is a recovery week. The thing is, it doesn’t look *that* different to the previous three weeks. The only change is no strength training. Whew.